Describing a show as ‘quiet’ could seem like the ultimate barbed compliment. But in an era of theatre that abounds with flashy lighting and furious energy, Estelle Savasta’s ‘Going Through’ is quiet in the best possible way. Often literally, when the two performers communicate using British Sign Language (BSL). And there’s also a kind of measured calmness to it that permeates its narrative of child migrant experience. It’s a deliberately non-country-specific story of Nour, a girl growing up in a remote house, looked after by caring mother-figure Youmna, who is D/deaf. 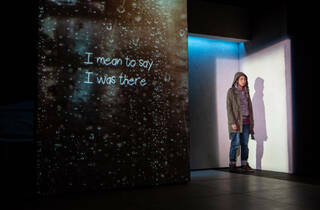 Played by Charmaine Wombwell and Nadia Nadarajah, Nour and Youmna communicate in sign language. In one oddly moving scene, they joyfully itemise everything they own like it’s the contents of Noah’s Ark, spelled out both by their hands and bodies and in projected childlike handwriting that covers the stage. It’s a warm portrait of growing up with a D/deaf caregiver, with just enough projected subtitles and spoken translation from Wombwell to bring a hearing audience into its world. Nadarajah recently made hilarious work of a role in ‘As You Like It’ at Shakespeare’s Globe, signing her way through the text and navigating endless misunderstandings from hearing characters. Here, things feel a bit more serious. You know that feeling when you watch a foreign-language film and see a whole animated speech distilled into a few bald English words? Well, watching Nadarajah’s signing is like that multiplied by 100. Her expressiveness challenges you to pay attention and to understand, even before Wombwell steps in to translate. And the gradual realisation that almost no one else speaks her language is devastating - especially when Nour leaves her to journey to a new country. Savasta is French, and ‘Going Through’ – originally called ‘Traversée’ – has been translated by Kristen Hazel Smith, into a form that mixes a kind of poetic otherness with Nour’s naive outlook on the people smugglers who lead her from taxi to forest to lorry. 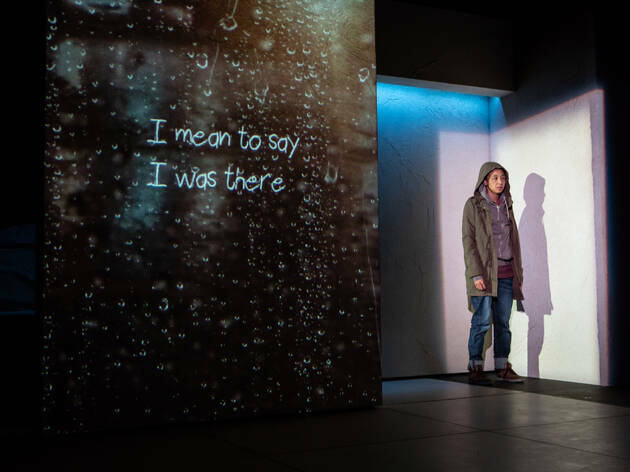 Omar Elerian’s production makes its locations feel vivid; Rajha Shakiry’s ingenious set design creates a crumpled twist of mountains, surrounded by screens that house projections by Nina Dunn. Their cinematic realism evokes small images, like the taxi driver’s comically misjudged attempts to give Nour a cassette tape of music, or the wider shock of her arrival in a built-up new city. ‘Going Through’ is a coming-of-age narrative as much as anything else, one with a poignancy that gathers pace and grows as Nour’s childhood becomes more distant. It’s a production that shows the richness of communicating using sign language and the losses, as well as the gains, of Nour’s integration into a new kind of life.